Oak Bluffs eighth grader Jocelyn Baliunas read a letter she wrote supporting the wind project. After receiving an unprecedented amount of correspondence ­— and a fair share of verbal testimony as well — the Martha’s Vineyard Commission closed a public hearing on the construction of two undersea cables that would connect the nation’s largest offshore wind farm to mainland Massachusetts. As of Thursday afternoon, the commission had received 87 letters relating to the project. According to executive director Adam Turner, 39 of those letters opposed the project, with the vast majority of those coming from people off-Island. He said about 90 per cent of the project’s supporters were Island residents. Vineyard Wind, a New Bedford-based energy partnership between Avangrid Renewables and the Danish company Copenhagen Infrastructure Partners, plans to build an 800 watt, 84-turbine wind farm 14 miles south of Wasque Point. Although most of the project is planned for federal waters, the commission has jurisdiction over a portion of two undersea cables that would run approximately one mile off the Eastern shore of Chappaquiddick. The commission is reviewing that part of the project as a development of regional impact (DRI). In February, after listening to testimony from the project’s supporters, Mr. Toole abruptly closed the public hearing engaging in a heated exchange with an opponent of the project, Helen Parker. The hearing was continued to this Thursday, when it seemed tempers had cooled. Mr. Toole apologized for the hearing last month and briefly outlined a new set of rules for testimony, including a five-minute time limit for speakers. On Thursday, Oak Bluffs eighth-grader Jocelyn Baliunas led off the testimony by reading a letter she and two of her classmates had penned in support of the project. Jocelyn said that despite concerns about the installation of the cable, she felt Vineyard Wind had come up with an effective plan to minimize the effects on wildlife. She also noted that four undersea cables already run from the Vineyard to the Cape. All told, the Oak Bluffs eighth-graders submitted nine letters in support of the project. Others who spoke in favor of the project included Islanders Tom Saldini, Jonah Maidoff, Allen Straylor, Tom Hodgson and Christine Gault. All echoed Jocelyn’s sentiments about the minimal environmental impacts of the cables relative to their importance for providing renewable energy. Middle school teachers and recent landowners, Zoe Turcotte and Timothy Penicaud, also spoke in favor of the project. “It can definitely be in our backyard,” Mr. Penicaud added. 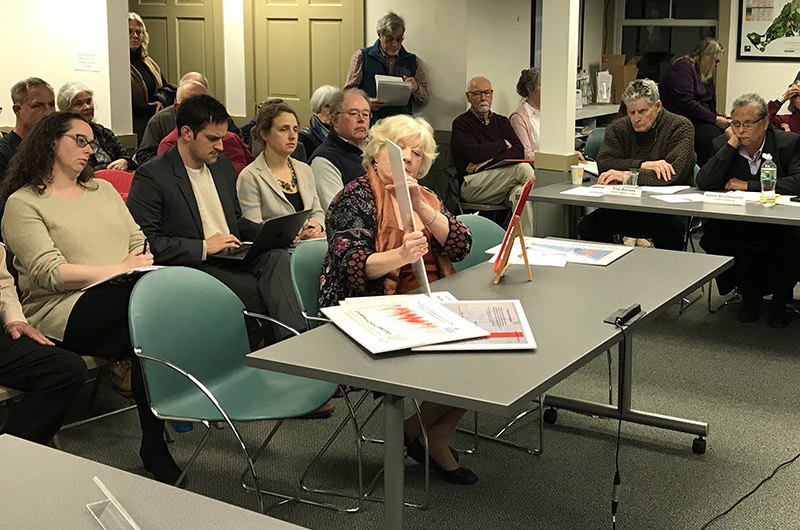 Allen Straylor, who is a scientist and member of the Edgartown energy committee, said worries about the cable’s magnetic field were unfounded. The project’s other vocal supporters, including John Packer and Peter Cabana, said their knowledge of previous cable installations and energy industry in and around the Island made them confident these cables were worth the minimal risk. Mr. Packer brought a cross-section of a six-inch undersea cable to show commissioners. The proposed Vineyard Wind project would include two cables, both 10 inches in diameter. “The reason the lights are on is that we have a cable,” Mr. Packer said. Others cautioned commissioners about the unknown effects of a 220-megawatt undersea cable. John Keene, a Chilmark resident and president of the Fishermen’s Preservation Trust, submitted a 2015 Bureau of Ocean Management report that discussed the potential dangers of undersea cables to migratory marine species, like squid, haddock, mackerel, herring and whales. Mr. Keene said Vineyard Wind’s proposed cables had 40 times the electric carrying capacity of the ones already in Vineyard waters. 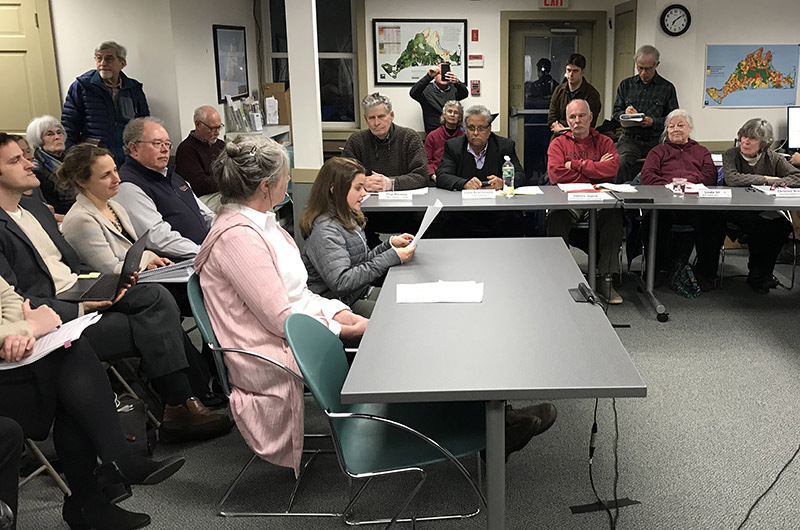 Aquinnah resident Megan Ottens-Sargent warned commissioners about the potential for a “spider web” of undersea cables if the current wind leaseholding companies don’t work together in the future. Vocal wind energy critic Helen Parker also spoke at the hearing, discussing the negative economic and environmental impacts of industrial wind farms. She argued that wind was the exact opposite of energy conservation because it led to greater fossil fuel usage as energy resources became more plentiful. “What I believe is that for 40 years we have been following the wind emperor and we don’t have a clue, as a world, as a nation, as a community, what is involved,” Mr. Parker said. Representatives from Vineyard Wind, present at the hearing, addressed the concerns of critics and commissioners, saying that a more recent BOEM study concluded that the cables did not hamper the movement of two species — lobster and skate ­— believed to be the most sensitive to electromagnetic fields. In response to other questions from commissioners about a cable off Block Island, they said that BOEM requires a decommissioning fund for the cable and that they would have a constant monitoring process to check if the cable became unburied. Vineyard Wind plans to bury the cable five to eight feet beneath the sea floor. Commissioners then closed the public hearing, leaving the written record open until March 28. No date has been set for deliberation or the post-public hearing review. Everyone should be asking why "According to executive director Adam Turner, 39 of those letters opposed the project, with the vast majority of those coming from people off-Island." Of those 39 people, most have suffered from wind turbine noise and shadow flicker and the effects of wind turbine infrasound along with massive litigation costs to protect their health from the wind turbines. Two 220,000 volt electric cables buried anywhere in a channel is not safe. With all due respect, a groundswell of support from indoctrinated children is not an adequate seal of approval. This project is dangerous. The health hazard is significant, and the project is economically unfeasible. There are better alternative energy solutions in development. This is invasive to so many ecological habitats, marine and terrestrial. The idea might be popular, but the small chorus of dissenters is much, much, MUCH more educated on the subject. Those underwater cables are dangerous! Haven't you all seen the end of Jaws 2? The shark bites the cable and gets electrocuted!! All of the sharks are at risk! I write this comment based on reading the MVC letters and the observation made that the 39 who oppose the project are “off Islanders”. The off Islanders are persons who have dealt with and experienced encounters with industrial wind turbines personally; we either know someone, personally, who has been impacted or have lived the reality; because of that, we have done an extraordinary amount of homework. Those who are proponents of the project do not appear to have had that experience, nor do they seem to want to know more. Keep in mind that being first is not necessarily a benefit unless you have no doubt that it is the best thing for the people of the Island, those who visit, those who have a livelihood offshore of the island, those who ferry, the wildlife living beneath the ocean and above. Look to Europe for reality based on years of fighting wind turbines; look to tiny Denmark, which as stated by one writer is approximate size (+-) to Massachusetts and realize that Europe has over 2000 anti-wind turbine groups and tiny Denmark has 200 anti-wind turbine groups; they are fighting both onshore and offshore industrial wind turbine projects. Why would that be? In response to the wind project, children wrote letters to MVC and a child spoke in favor of the VW at the public hearing; there are many children who have suffered the tortures of wind turbine noise who would not speak in favor; people have left their homes; the Island is only 14 miles from the turbines, you will be impacted; what of the repair boats and known collisions with the turbine structures; cable incidents; what of potential oil spills; how tall are the MHI V164-9.5 MWs; why approve the cable aspect without knowing every detail from around the globe? The off Islanders who write are concerned because they know the truth, they have lived the reality. This caution goes both ways: “Members of the public who support the project cautioned the commission against false information.” I caution the commission and the project supporters to know the truth, every detail of the project, BEFORE YOU GIVE SUPPORT OR APPROVAL. There is no harm only benefit in that. What is the hurry? Oh, yes, tax credits and other incentives$$$. Once the project begins, there will be no stopping it. Get it right before the destruction begins. We need to stop it! Wind energy is natural and abundant here and we should take advantage of it now. Cables buried 6 or 8 feet deep on the ocean floor is acceptable to all but a few who would never accept them. It time to act like responsible adults I trust the MVC will approve the project. I find the use of children here somewhat disturbing. It is rather difficult for a young child to fully comprehend the impacts of marine cables on delicate ecosystems. Vineyard Power inserted itself as a "local" player, and has been grooming our community for almost a decade for this outcome. Judging by the number of letters of support, it appears their strategy is effective. Important to note: there are 4 cables coming to the Vineyard. None of these cables have a capacity of over 19MW. This proposed cable is a 220MW cable - that is more than 10 times the capacity of the current largest cable, and more than 4 times the capacity of all 4 cables combined. To use as an argument that “there are already 4 cables coming here” shows a lack of understanding of the magnitude of this project.